I was really excited when nanny told me the second Tess had arrived. I couldn't wait to try it out. 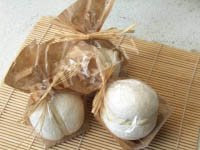 The first one was lovely and the little bag was so sweet.It looked like a fresh cream meringue. Almost good enough to eat. Tonight I filled the bath up with hot water,climbed in and dropped the Tess in the water. I loved the way it fizzed because it looked like it was about to explode and it smelt like creamy buttery white chocolate. (yum yum)The fragrance stayed in the bath until I let the water out (wow) The cream melted well and it didn't leave greasy marks on the sides of the bath.